At the age of ten, children enter into pre-adolescence, during which they grow rapidly and mature more every day. Some boys will see their voice already begin to drop; some girls may begin menstruating. Those 10 year old seem to be quite adult sometimes, and very much like a child the next. As they learn to navigate their new life, they have to worry about their bodies, too. Questions like body weight become quite popular among not only these kids, but their parents as well. How Much Should a 10 Year Old Weigh? A child should grow steadily through years. Some years might be greater than others, as children go through 'growth spurts', which means they suddenly gain more weight and height. As a general rule of thumb, children should grow about five pounds each year. By the age of ten, they will be at a certain weight, according to the typical growth charts. 10 Year Old Girl: At the age of ten, the girls will weigh about 70 pounds (32kg) on average. However, since there is a wide range of sizes among kids this age, girls might weigh anything from 53 to 102 pounds and still be considered to be healthy. The height of 10 year old girl can be generally around 54.5 inches. 10 Year Old Boy: Boys tend to weigh more than girls as they get older, but at this age the girls are heavier. Boys tend to weigh about 68 pounds (31kg) on average; normal range is anything from 57 to 100 pounds. The height of 10 year old boy can be generally around 54.5 inches. A healthy body weight matters, even for kids this young. It is a good start to figure out how much should a 10 year old weigh. Keep in mind that being overweight can lead to serious problems, such as high blood pressure, heart issues, gall bladder disease and even stroke. However, being underweight can be a problem too, as it leads to just as many life-threatening conditions – it just might take longer for those conditions to occur. Body mass index or BMI is a measure of just how healthy you are. However, sometimes this can be misleading, as someone with a high BMI can be healthier than someone who appears to be right within weight range. That's because the BMI is based on weight and height, but so many other factors play into health that are not considered by the BMI charts, one of them the muscle mass. African-Americans at 10 years old tend to have a quite high BMI due to their muscle mass instead of fat at this age. To figure out the BMI of your child, check out this BMI calculator created by the CDC. A very high BMI might indicate that a child is overweight, while a BMI that is too low indicates a child who needs to put on weight. Since BMI is not necessarily the final say in just how healthy a child is, it's a good idea to speak to your doctor if you are worried about your child's BMI and growth. 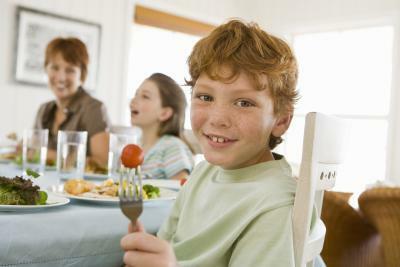 At this age, most kids will eat plenty of foods, but perhaps not a big variety. Encourage them to eat more by offering a variety of colorful foods for their plate, keeping snacks out of the house, eating dinner and other meals together as a family, and having intelligent conversations during those meals. Just try to talk with your child about eating a balanced diet and remember that they learn by watching you – what you eat is what they will want to eat, too. Most children are able to fall right to sleep at this age, but some things might keep them up, such as too much homework or desire to play with friends. Encourage good sleep habits by getting your child into a routine, and set a bedtime that stays consistent, even on weekends. At this age, kids are exploring their bodies and what they can do. If you haven't had'the talk'with your kid yet, now is the time. Don't wait until they are older; children today are much more advanced physically than older generations were at this age. Make sure they understand sexually transmitted diseases, pregnancy, and how their bodies work. Remember, their good health goes well beyond understanding the question—how much should a 10 year old weigh? Good health includes much more, such as having a strong social circle, avoiding drugs and alcohol, not putting up with bullying or intimidation, not smoking, having enforced standards on music, television, movies and video games, and much more. It is your job as a parent to see that your 10 years old child has all the guidance they need either from school or family. What Are the Signs of a Broken Nose in a Child?